We wrap up this week-long tour of hockey's greatest own-goals with entries from all over: the KHL, the NCAA, the Swiss National League B, an IIHF tournament and, of course, NHL action stretching back over decades. If there's one thing that this list -- and especially this final batch of 10 makes perfectly clear -- it's that hockey is alive and well all over the world. And if there's a second thing, it's that at no point in a player's career does he become incapable of self-victimization. Like I said, the game of hockey is alive, and sometimes it turns on you like an angry animal. These 10 guys can attest to this better than anybody. There are so many things to like about this goal, which comes when Halak attempts to swat an airborne puck out of the air and throwing it over his shoulder like good luck salt for the own-goal. There's the ho-hum, low-key way he confidently plays a puck to the corner at the beginning of the clip. There's the circus music that starts playing at around 0:45. And, of course, there's the part where he does the hilarious thing. And there's the way the puck seems to adhere to his stick on the swing. Amazing. It's not uncommon for an own-goal to happen just after a penalty. When the goalie leaves the net, all bets are off. But less than a month ago in a college game between state rivals USC and UCLA, the Bruins gave us the rare own-goal after the goalie came back. After the Trojans ice the puck, two Bruins head back to regroup. Unfortunately, their method of regrouping is, well, one of the worst things I've ever seen. Be sure to appreciate Charlie Linehan's FML stick-flip after the goal. And speaking of own-goals on delayed penalties, nobody has ever done it better than Niclas Wallin. After Josef Vasicek draws the hooking call with an incredible power move to the middle, he turns around and feeds it back to Wallin to set up the 6-on-5 situation. Instead, Wallin bobbles the puck at the blue line, then turns with it under pressure, skates back to the red line and, puts it into the yawning cage. I've always suspected the official that crosses in front of Wallin blocked his view of the empty net, but even still, the guy skates halfway through the neutral zone. How are you that unaware your net is empty? Amazing. It's not all that dissimilar to Jaro Halak's own-goal at number 10, really. After making a save, Ramo takes a swipe at the airborne puck. The difference is that, while Halak was trying to swat it away, Ramo appears to be attempting to knock it up and into his glove. Yeah. It's a dumb plan, and when he instead hooks it into his own goal in what seems like excruciating super slow-motion, even the announcer can't help but laugh. Come to think of it, his entire call is hilarious, especially when he goes "No, Ramo," as though he's scolding the Finnish netminder like a bad puppy. This countdown has featured several own-goals where a defenceman gets the puck off the faceoff, then turns and buries it into his own goal, but here's why this one trumps the offerings by Mats Trygg, Gerald Diduck, and Giacomo Casserini. Those guys all did it with a guy bearing down on them that either forced or deflected the errant shot. Furrer, on the other hand, is under no pressure whatsoever. Yet he still nearly puts the puck through the back of the net. Incredible. I think it's safe to say Fröhlicher did not intend for this to happen when he fired the outlet pass. For pure comedic return, this is my favourite goal on the list. It's up there with cats wearing fruit helmets. It just happens so suddenly, so unexpectedly, and it's so completely unrepeatable. I also like the way Cristobal Huet drops to his knees like this moment is akin with Charlton Heston discovering the Statue of Liberty on the beach. Oh, Ryan Suter, you so crazy. This isn't soccer! (Also, even if it was soccer, you totally just did it wrong.) It's worth nothing that this isn't a terrible defensive play. Corey Perry's saucer pass appears to be perfect, and if Suter doesn't get something on it, it sure looks like it's going to drop right in front of Teemu Selanne. That's a nightmare scenario, so Suter kicks at the airborne puck. Unfortunately, it leads to another nightmare scenario: the one where he kicks the puck right into his own net. His reaction is priceless, as is the fact that it was the second own-goal Suter had scored in the game. Group C at the 2004 Men's World Ice Hockey Championships was comprised of Russia, Sweden, Denmark and Japan, so it was basically a foregone conclusion who'd be moving on. But the game between Denmark and Japan wasn't just a mean-nothing affair. As the only winnable game for either, the victor would avoid a trip to the relegation round, where the bottom two teams would be booted from next year's tournament. Denmark and Japan battled to a 3-3 tie until late in the third period, when Nobuhiro Sugawara hammered home a perfect pass from across the crease, briefly celebrated the absolutely massive tally, then realized he had scored it on the wrong goal and collapsed into a devastated heap. It's equal parts hilarious and sad. It gets sadder every year, too. Japan finished third in the relegation round and was bumped down to Division 1. 8 years later, they're still there. For me, this list's order should be about two things: how unusual the own goal is and the context. While Smith's own goal isn't the most unique-looking one in these posts, the entire picture surrounding that goal is what puts it over the top for me. In the spring of 1986, the Edmonton Oilers were rolling. They were coming off back-to-back Stanley Cup titles, won the Presidents' Trophy, scored an obscene 426 goals and breezed by the Vancouver Canucks in the opening round to set up a "Battle of Alberta" matchup in Round 2 with the Calgary Flames. The series, like the rivalry, was intense. Both teams alternated wins, setting up a Game 7 at Northlands Coliseum. 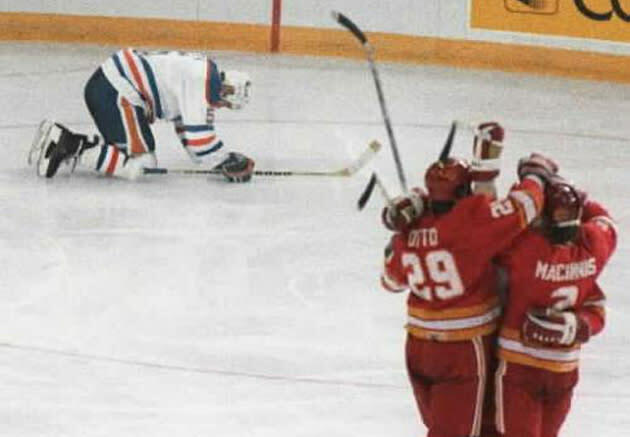 Early in the third period, the game was tied 2-2 when Smith banked that pass off Grant Fuhr and into the Oilers net. The team that scored 426 goals during the regular season couldn't muster another one and fell to the Flames. What a sick feeling for the 23-year old defenseman. Just watch at how he crumples to the ice moments after the puck goes in. He knows, for whatever reason, in that moment, the hockey gods were against him. That was how his rookie season in the NHL ended. Making matters worse? It was his birthday. You probably enjoyed your 23rd birthday with a nice dinner, maybe some drink and fun times with your friends. Smith had to skip past that replay on his television for an entire year. Fortunately for Smith, the Oilers were still the Oilers and would go on to win three of the next four Cups. Had this been a list of the most creative own goals, I'd agree with the number one selection. But this is the list of "worst" own goals. It has to be Smith. I know. Some of you disagree. Sean Leahy disagrees. Allow me to explain. When we began this list, several people joked that it was really a countdown from 50-2, because Steve Smith was such a de facto number one. But here's why I don't think that's the case: sure, there's a boatload of hockey history behind the Smith goal, and with 26 years of mythification, it's practically become an unassailable moment. But frankly, the context is the only reason Smith's is considered so bad. If you look to form -- when you consider how the puck ended up in the back of the net, and that matters -- it's really not all that special. Smith victimized Grant Fuhr, banking the puck in off the goaltender's skate. But Marek Malik (no. 36) and Erik Karlsson (no. 34) made appearances on this list for doing the exact same thing. Thus, the argument for Smith at number one comes down to the details, which Leahy made very clear. But there have been own-goals at more meaningful moments. This list has two Stanley Cup-winning goals, one courtesy Marc-Andre Fleury's backside (no. 32), the other thanks to Chris Phillips' mad dangles (no. 15). Smith's mistake comes during Game 7 of the Smythe Division Finals. It could have been two rounds worse. Of course, I've heard the argument that Smith's play didn't just cost the Oilers the Stanley Cup -- it cost them the prospect of 5 in a row, since they won the two before and after. "The goal that stopped a five-peat", a commenter called the debacle on Wednesday. Perhaps. But it's a highly presumptuous statement: If they were such a lock to breeze through the 1986 playoffs, they wouldn't have been done in by an own goal late in game 7 of the second round. All that in mind, I know it's near-blasphemy but I don't think the context alone is enough to cement Smith at number one. That brings us back around to form. And this is where Bergevin pulls off the upset. As far as I know, the former St. Louis Blue and current Montreal Canadiens general manager is the only player in hockey history to catch the puck and just... chuck it into his own net. How in Hell. It's a bizarro, once-in-a-lifetime, head-scratcher of a batcrap play that is, in my opinion, a cut above everything else we have here, Smith's legendary tally included. What's more, the play is so outside anyone's frame of reference that everybody involved just sort of... blacks out for two full seconds. Nobody on the ice reacts. The announcers say nothing. The fans fall silent. The goal judge forgets himself. Even the officials just stand around, which is my favourite part. If you think about it, the goal really shouldn't even count. Play should have been blown dead for a penalty the moment Bergevin closed his hand on the puck, which he obviously did. I mean, how else could he have thrown it with such inadvertent precision? But because the sheer absurdity of the play causes even the officials to lapse into a momentary fugue state, Bergevin somehow gets away with it, allowing the moment that he burns Roman Turek with a side-arm slider to be immortalized forever. The own-goal really isn't as rare as it's made out to be, a fact evidenced by the fact that we just counted down 50 of them and there are, without a doubt, notable omissions. As I said in introducing this list: it happens. In fact, every play on this list will likely happen again. Bergevin's happening again, however, is unlikely. And that's why it's my choice for hockey's worst own-goal.